Google has spent years building out a third party partner/reseller network focused on small businesses (SMBs). And while there have always been ROI (perception) and retention challenges with AdWords, a new survey from BrandMuscle suggests paid search is being deprioritized by SMBs in their overall marketing mix. Paid social top channel, paid-search 9th. 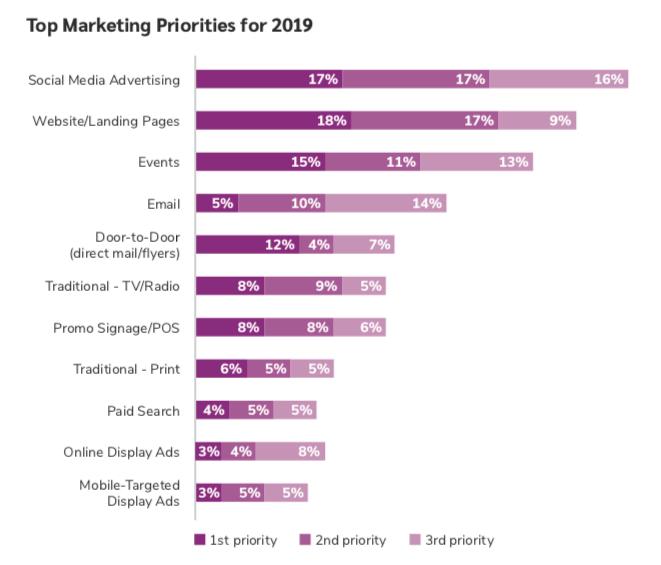 In the survey of 1,000 SMBs, social media advertising was the overall top marketing priority. The data comes in the 5th edition of BrandMuscle’s “State of Local Marketing” report (registration required). The survey population consisted of franchisees, dealers, retailers and channel partners, 73 percent of which had only a single location and 50 percent of which had fewer than five employees. The report is lengthy and contains numerous findings, but it is notable that social media advertising beats out paid-search by a wide margin. 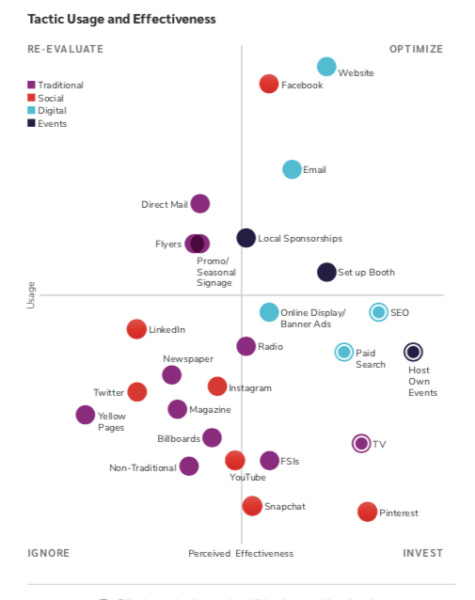 The latter ranks 9th on the list; even traditional print advertising beats it. Only display advertising is lower. Perceptions of the most effective tactics. SEO, which was not a choice in the ads chart above, was a one time the top SMB marketing tactic. But it was eclipsed a couple of years ago by organic social media. Previous third-party surveys indicated SMB confusion or frustration in understanding the ROI of social media. But there’s evidence that a major driver behind SMB marketing strategies is competition, not ROI. However, this explanation doesn’t fully account for the significant gap between paid search and paid social in the BrandMuscle survey. In the 2018 edition of the State of Local Marketing report, Facebook and paid search were seen as roughly equally effective. 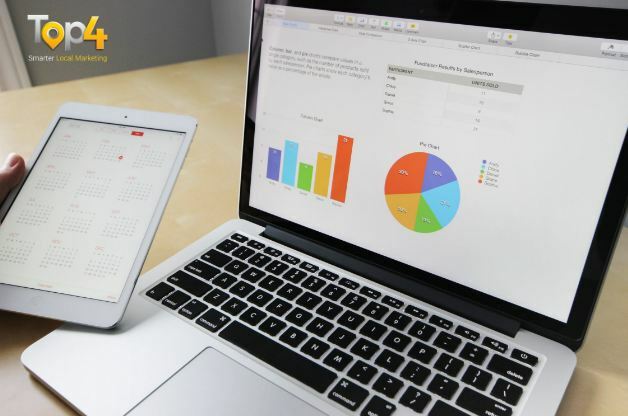 SEO was seen as more effective than both and websites outranked all other tactics, as they did in the 2019 survey. Lack of expertise potentially to blame. The fact that “website” is seen as the most effective marketing tactic suggests that SMBs don’t fully understand consumer behavior and are relying on last-click ROI thinking to guide their perceptions. In addition, the majority of SMBs in the market don’t have professional in-house marketing people and don’t work with agencies. Accordingly, they may blame the channel or tactic when their own lack of expertise or skill results in a mediocre outcome. This has been a historical problem with SMB experiences with paid search. One of the “positive” findings, most of the SMBs in the survey recognized that their marketing was not keeping up with consumer behavior. Less than a third of respondents judged their marketing programs “up to date.” And 84 percent wanted to learn more about marketing to improve their performance. This indicates an ongoing appetite for more education. Facebook is benefitting from its ubiquity and some relatively simple adoptions for small business owners. Paid search may be struggling because of the complexity of self-service campaign management. Automated tools for SMBs, such as Smart Ads and Local Ads, may be an answer. But if these survey results can be generalized to the larger population of local businesses, Google and Microsoft have their work cut out for them. Get Found On Google Promote Your Website, Reach local customers today! Our Digital Marketing Agency Services Across All Industries Include Search Engine Optimisation (SEO), Google Marketing, Website Design, Corporate Web Development, and local location-based marketing using our own Google Marketing Platform! Engage A Social Media Agency For Only 1/3 The Cost Of Employing A Social Media Manager…LET’S TALK!